Edgar Degas (1834-1917), Danseuses, signed 'Degas' (lower left) pastel on paper laid down on board, 20 1/8 x 15¾ in. (51.1 x 40 cm.) Drawn circa 1896. Estimate: $7-9 million US. Photo: Christie's Images Ltd 2009. 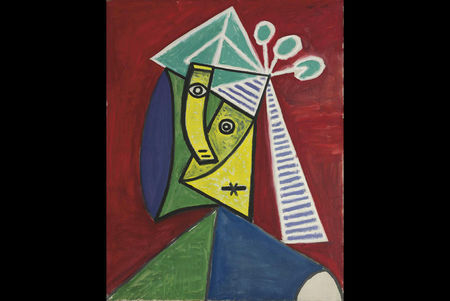 • Tête de femme, 1943 by Pablo Picasso (1881-1973), a vivid portrait of Dora Maar painted during the darkest days of WWII in Paris (estimate: $7-10 million). 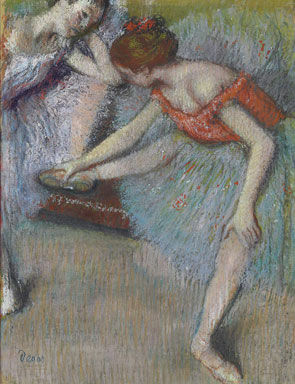 one of Degas’ most sought-after subjects (estimate: $7-9 million). • Vétheuil, effet de soleil, 1901, by Claude Monet (1840-1926), from an important series of views Monet completed of this picturesque village on the Seine (estimate: $5-7 million). • Le Pont du chemin de fer, Pontoise, circa 1873, by Camille Pissarro (1830-1903), a luminous and classically composed landscape that captures the essence of early Impressionism (estimate: $3.5-4.5 million). • Le Baiser (The Kiss) by Auguste Rodin (1840-1917), an exceedingly rare lifetime cast of one of Rodin’s most celebrated subjects (estimate: $1.5-2 million). • Rosace, 1954, by Henri Matisse (1869-1954), the artist’s final major commission; a paper cut-out used as inspiration for a stained-glass window created in memory of Abby Aldrich Rockefeller (estimate: $3-4 million). • Composition II, with Red, 1926 by Piet Mondrian (1872-1944), one of only two surviving paintings from a pivotal series of works known as the “Dresden Paintings” (estimate: $4.5-6.5 million). Among the most anticipated works to be offered this season is Picasso's vibrant Tête de Femme from 1943, a wartime portrait of the artist's muse and mistress Dora Maar. Painted in October 1943 during a period of continued hardship and deprivation in Paris, the portrait is remarkable for its bright, saturated colors and celebratory air -- an effect quite different from the mostly somber-hued portraits by Picasso from the same period. Dora Maar is discernible in the simplified and disjointed face in the painting by her large staring eyes, trademark raven hair (represented here as an elongated dark blue oval), and her customary hat, dressed in this depiction with three flower-like pins and a trailing ribbon. Additional Picasso works in the sale include Mère et enfant, 1925, a tender depiction of the artist’s son Paulo and his first wife Olga Khoklova, (estimate: $600,000-800,000); Courtisanes et toreros, 1959, a humorous pen and ink drawing of off-duty bullfighters (estimate: $600,000-800,000); and Visage féminin, profil from 1960, a late-career portrait of Jacqueline Roque painted a year before her marriage to Picasso (estimate: $600,000-900,000). Rounding out the exceptional offerings of Impressionist works in the sale is Monet's Vétheuil, effet de soleil. This sun-drenched view of the picturesque village of Vétheuil was painted in 1901, when Monet was refining the distinctive serial approach that would yield some of his most celebrated late career works, including the water garden paintings at Giverny. All fifteen of the Vétheuil paintings, including the present work, take in the same view from across the Seine, varying only in lighting effects and weather conditions. Vétheuil, effet de soleil was one of a number of works from the series that was purchased by Galerie Durand-Ruel in 1902, where it remained until its sale to a private collector in 1949. Seven of the 15 views in the Vétheuil series are now housed in major museum collections around the world, including the Musée D'Orsay and the Pushkin Museum. Also from the Dreyfus Estate is Wassily Kandinsky's Winkelschwung (“Angular Swing”) from 1929 (estimate: $1.5-2.5 million), a vibrant work that bears the influence of the artist's teaching residency at the legendary Bauhaus. Populated with geometric shapes, lines, and points arrayed along an obtuse angle, the painting may be read as a landscape of buildings and tree forms, or as an interpretation of the Bauhaus campus itself. Composition II, with Red, 1926 by Piet Mondrian is a highly minimal painting from a pivotal year in the artist’s career during which he broke with the de Stijl movement and embraced his own individualistic style. Consisting solely of four straight lines and one primary color on a white background, Composition II, with Red is from an important group of four paintings often referred to as the “Dresden Paintings”. The only other work from this outstanding group that is still known to exist is Composition IV, with Red, now in the permanent collection of the Kaiser Welhelm Museum in Krefeld. Few 19th century sculptures are more instantly recognizable than Rodin's Le Baiser (The Kiss), a romantic depiction of an embracing couple inspired by a tale of forbidden love from Dante's Inferno. Christie's is pleased to offer an extremely rare bronze cast of the sculpture, one of only five created during the artist's lifetime from the plaster model of the sculpture known as the Milwaukee version. In these versions only, the male figure's right hand is lifted slightly from the thigh of his lover so that it appears to hover tentatively, a poignant gesture that Rodin called "more respectful". Owned by Geraldine Rockefeller Dodge until 1975, this elegant, 34-inch tall bronze has been in a private collection in New York for nearly 35 years. Rounding out the sculptural highlights in the sale are Alberto Giacometti's Femme Debout, (estimate: $1.4-1.8 million) from a series of thin, elongated standing female figures the artist conceived in 1960- 61; Edgar Degas' Grand Arabesque (estimate: $500,000-700,000), an elegant bronze of a young female dancer in mid pose, extending her body from fingertips to toes; and Rodin's Néréides (estimate: $200,000-300,000), a depiction in bronze of three intertwined sea nymphs. 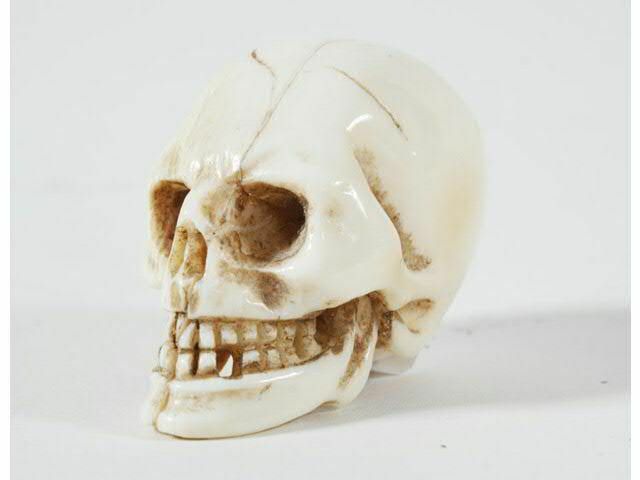 VANITÉ, CRÂNE EN IVOIRE FINEMENT SCULPTÉ.